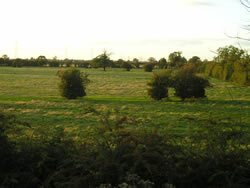 This footpath starts from the busy Beckingham to Gainsborough road and it is advisable to walk as far as possible along the grassy track that runs parallel to the road (down towards and past the village hall) for as long as possible before joining the tarmac path. Once on the tarmac path continue over the railway bridge and under the electricity pylons until you see the sign. The path goes down a fairly steep bank and across 2 stiles at the bottom to a field. At the end of the field is another stile and a "trip trap" bridge over a dyke. Exit the field via the opening in the hedge which brings you onto Old Trent Road and cross over the railway junction onto Station Road and back to the village.